Military Technology, Armored Fighting Vehicles, Small Arms. @fingolfin May I suggest something. AAF might need a proper cargo/cargo-armed helicopter and so a Mi-8/Mi-17 variant would be good option? We have some in RHS. Also AAF wheeled APC can be BTR-80A. Cheers. No problem. Oh yeah by the way, the M2A4 Slammer UP, the uparmored variant, in IDF service it would be named Merkava Mk4M LIC. LIC is short for Low Intensity Conflict. @hcpookie I noticed one bug caused by VME PLA. It seems that for some reason it is conflicting with many other mods causing for example truck mounted weapons not to function. One example are vanilla MLRS having no gunner seat or RHS trucks like Ural with ZU-23-2 AA guns. @massi If I may suggest something when it comes to a bit of realism. 😉 Designations of ground armored vehicles should look like this. Instead of Merkava Mk-IV, the real designation is Merkava Mk4 (IDF do not use Roman numerals), and to be even more precise, in game vehicle is Merkava Mk4M. The Merkava SPH should be named Sholef, as the real world counterpart. There is of course Namer APC, the in game CRV variant should be called Namera (or Nemmera depending on source) as the real world ARV. The AA variant can be named Bardelas. Merkava based MLRS could be named either Menatetz or Romach as the real world IDF MLRS variants are named like that. We do not have Trophy APS, nor M1A2C in the mod... at least yet. 😉 I was speaking about real world. 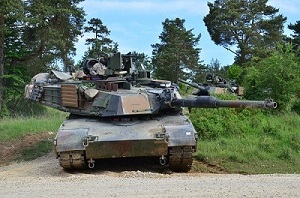 The external ammunition box was added to T-90AM/SM/M to increase vehicle survivability by moving secondary ammunition from crew compartment to safe external storage, leaving only 22 rounds in autoloader, which is safer as autoloader is quiet low and have some spall shields, altough still any direct hit there will cause catastrophic ammunition cook off. Also there is additional 8 rounds inside stored inside fuel tank. As for burning material it's not a problem, if burning propelant charge is spit around vehicle it will not cause anything more than cosmetic damage, even burning fuel or napalm etc. will not cause any harm if crew hatches are closed. However flames can cause some problems, if they are sucked by engine air intakes these flames can damage some things like air filters etc. Or can be sucked by the NBC protection systems. This is why it's advised, that when possible turret should be rotated to 9 o'clock, 3 o'clock or 6 o'clock, so turret bustle is either on the side of vehicle or over front glacis plate. So this is for example how it looks like in M1 Abrams tanks. And here something from manual. As for implementing this in game, we want to have such system at one point, but do not expect it anytime soon. In case of new ammunition, maybe, dunno. T-90, T-90A, T-90S and T-90SA uses 2A46M-2. T-90AM, T-90SM and T-90M uses AZ-185 autoloader under the turret. AZ-185 is upgraded wariant of AZ-125 used in T-72 series and it's the same one used in T-90A and T-90S. AZ-185 main upgrade is capability to use APFSDS rounds with penetrator lenght of ~740mm. As for turret bustle, well these tanks do not have a real turret bustle, what they have is an armored box bolted to the turret rear bulkhead, for storage of some secondary main gun munitions (projectile + propelant charge). The crew does not have any access to this box from vehicle interior so to use ammunition there, they need to leave vehicle. Similiar in concept armored box is bolted to the rear bulkhead of the turret of BM "Oplot" tank. In general T-90AM, T-90SM and T-90M will have slightly better survivability in case of it's armor being pierced than Leopard 2, because in these T tanks, autoloader and secondary ammunition rack, are placed slightly lower than hull ammunition rack of the Leopard 2. However their survivability will still be lower than that of the M1A1 and M1A2 tanks, because these have their entire ammunition for main gun, stored in isolated ammunition magazines. These magazines are isolated by thick, sliding armored doors, and have blow off panels. This is photo I made inside an M1A2SEPv2 (it was quiet an old example from one of the first production batches, so quiet an used tank before main overhaul), you can see two blast doors for both turret magazines, each magazine stores 18 rounds so 36 rounds in total. And this is hull ammunition magazines, with one of the blast doors opened, each of these magazines hold 3 rounds so 6 in total. Yes this was a false information. T-90AM/SM and T-90M uses 2A46M-5 gun, not 2A82. Nope, 2A82 gun in any subvariant can't be mounted in any legacy tank. This gun fits only T-14. It's breech is too large to mount in older vehicles turret, and also would demand very serious modifications to the hull to fit it's new autoloader, in general it would mean cutting hull sides and welding them again to make vehicle wider. No no, neither T-90AM nor T-90SM nor T-90M can use 2A82 125mm smoothbore gun used by T-14. As you can see such modifications would be required, this makes such modifications extremely difficult, and extremely expensive. T-90AM/SM can use either RWS with 7.62mm MG or 12.7mm HMG. Festival just deciced to give them different RWS to make them slightly different as far as I know. There are photos in the internet of T-90SM with 12.7mm HMG installed. @koffeinflummi I have a curious bug to report. It seems that BWMod for some reason, when loaded, causes a bug with cutscenes in some campaigns, dunno why. I especially noticed it with Cnotk Cold War Crysis campaign remake. Indeed you are right on this subject. In RHS we do not have M1A2SEPv2 with M153 CROWS-2 (yet) but in general CROWS optics look like this: 1x magnification day channel, 4.3x magnification thermal channel, 12.5x magnification thermal channel, 15x magnification day channel, 30x magnification day channel. I think the same goes for M151 CROWS as well. In general @HBAOplus I think you should take peek at RHS when it comes to vehicle optics and FCS, as we always try to keep is as realistic as it's possible in arma engine. @CUP Hope this information will also be usefull.